Inspired by the video game’s chalice dungeons (which I never made it to, cuz life is to short to play video games that make you angry) players fight monsters together, and visit the hunters dream to bank their blood, and upgrade their hand of cards. 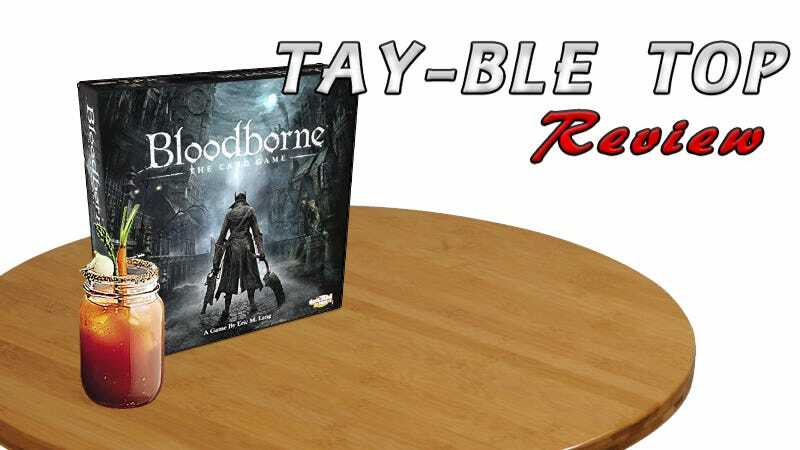 At it’s core Bloodborne is a game about getting what you want out of your fellow players before screwing them over, and either killing them, or snatching a kill out from under them, denying them those sweet sweet trophy points. Players collect blood echoes for damaging monsters, and trophies for doing damage on the turn the monster is defeated. Just make sure you remember to visit the Hunter’s Dream to bank all your hard earned blood echoes, cuz if you die you lose them all. You start the game by first creating your dungeon deck from the games selection of baddies. Each dungeon is randomly comprised of one boss, three mini-bosses, and seven monsters, some games you may get lucky, and have a deck filled with easy (green) enemies, and other games it will seem like you are getting nothing but hard (red). The players also have an upgrade deck available to them, and every time they enter the hunters dream they may select a new card (in turn order) to add to their hand. Players can never own more than seven cards, players don’t have a deck in this game, just their single hand. Next hand each player their starting hand, a life counter, and a scoreboard, and you are ready to play. Set up in this game is great, and super easy, you are up and playing in roughly 2 minutes. 1) Play a Card - Each player selects a card from their hand and places it face down in front of them. You can talk about what card you are gonna play, say you are gonna work together with the other hunters, then play something totally different and screw someone over. Play whatever you want, just keep it a secret until everyone has a card face down in front of them. Once everyone has card in front of them, flip your card over for all to see. Once a card is played, it is out of your hand until you visit the Hunter’s Dream to restock. 2) Transform Weapons - Everyone who played the Transform card gets to resolve it now. In turn order every player who played Transform selects a weapon from their hand and plays it face down, then reveal once all players have played. Basically this lets you decide what to play after you’ve seen other peoples cards. Did some jerk play the flame sprayer? Might want to play your Blood Vial. Are they players before you about to kill a monster before you get a chance to hit it? Now is probably a good time to use your Hunter’s Pistol so you get in on those trophies. 3) Resolve Instant Effects - If any hunter played a card with an instant effect, that happens now. Instant effects can be super handy allowing you to squeak in some damage before the other hunters kill the monster, ensuring you get a trophy, and sometimes screwing other hunters out of a kill. Many instant effects also allow you to damage your fellow hunters, steal their blood echoes, or weaken their attacks. And finally... If you wanna play safe, Blood Vials heal you during this step, but what fun is healing yourself when you can attack your fellow players. 4) Monster Attacks aka. The Part Where You Die - Time so start rolling, and hopefully you don’t have to roll too much... Each card has a colored lantern on it, showing what dice it uses for damage. Green dice are easy, yellow are medium, and red are deadly. The active player rolls for the monster damage, and it applies to every hunter. Some of the sides of each die also include a little + symbol, this is what will probably kill you. Every time you roll a + you roll again and keep adding your numbers together. I have had a rough string of rolls, and had a green monster wipe our entire group. 6) Monster Escapes - If the hunter’s don’t manage to kill the monster, it escapes, and is removed from the game. All those possible blood echoes leave with it, and nobody receives a trophy. Some monsters, like the Brainsucker do bad things to the players if it manages to escape, so... will you help kill the monster? Or will you say you will, and ditch to the hunter’s dream? If you are fighting a mini boss, or the main boss, they don’t run away, they must be killed in order to proceed. 7) Hunter’s Dream - If any hunter’s played the Hunter’s Dream card in step 1, now it’s their turn (assuming they survived the monster’s attack). If you played this card, you get to bank all your blood echoes, gain a new upgrade card, refill your hand, and heal to full health. If you died when the monster attacked, you still get to take part during this step as well. You gain a new upgrade card, and refill your health, but you don’t get to pick up your used cards, and all your blood echoes were lost... sorry... Remember you can only have 7 cards, so if you take your eighth, you must also get rid of one. 8) Reveal a New Monster - Now that some of you are healed, and have a full hand again, it’s time to reveal a new monster. Many of the monsters have effects that must be resolved when you reveal them, sometimes granting blood echoes to the worst performing hunter, sometimes inflicting damage to the character with the most cards in hand. With the new monster revealed, proceed once again to step one. Look, I know that’s alot of text for a single turn, but it all happens in a couple minutes... This is a fast game to play. Players keep doing this until the dungeon deck is empty (10 times, unless you are playing with Micolash), then proceed to fight the boss. Once the boss is dead, players add up their blood echoes, and trophy points. The player with the most points is the winner, and depending on how awful you all were to each other, you can start all over. I love how quick the game is to set-up and play. If you’re looking for something to kill roughly 30 minutes, you could definitely do worse. It’s also super easy to learn, my wife isn’t super huge on board games because so many have just gotten so complicated. After a single round of playing you’ve got a solid understanding of exactly how the game works. The artwork on the cards is also awesome. They could have been lazy and just used screenshots from the game, but they didn’t, which is great. The production quality is also great, cards are sturdy, blood echoes are little plastic tokens, where other games would have just used cardboard punch outs. The price point is also super reasonable at only $30 (Canadian), you’re not breaking your wallet. The actual mechanics of the game are alright. I’ve played games where you die every other turn, which can start to get a little frustrating. I’ve also played games where we are rolling lucky, and hardly take any damage through the whole game, which can get a little boring. I wish there was a little more consistency in the difficulty of the game, but sometime RNGesus just doesn’t want to cooperate. With a few house ruling alterations, I’m sure these problems could be alleviated. The game also does an okay job of capturing the feel of Bloodborne, it could be better, but it could be worse. I feel they did a pretty good job while also keeping the game simple to learn and quick to play. The card selection... There are so many weapons, so many items, so many enemies in Bloodborne, why is there such a small variety of cards in this game. 30 different monsters spread across monsters, mini bosses, and bosses which isn’t too bad, but many of the cards share the same kind of abilities. Also Rom’s boss card just doesn’t work. If you die twice, you are straight up out of the game. In a game where you can die at any second, and it’s mostly out of your control, that’s just not fun. The selection of upgarde cards is also lacking with so many duplicates. Basically none of the hunter tools from the video game are in this, and only about half the weapons. There is a fan made expansion that someone has made for the Tabletop Simulator version of the game that adds many new cards that look super interesting, and if I could find copies of them I would consider getting them printed and adding them to my physical game. All things considered, I have no regrets about picking up Bloodborne: The Card Game. It’s pretty fun to bust out for a quick game before supper, and is simple enough that anyone can play it. Where it lacks in card variety, it makes up for it in design. And only costing $30 in a world where board games are commonly twice that, it definitly feels worth what I spent. I’m sure I’m gonna be playing this for quite a while. If you are an avid board gamer, and enjoy all those crazy complex games, you may want to skip this one, as it is very simple to play. But if you are looking for a game to bust out and quickly anger your friends and relatives, Bloodborne is a great option! If you are looking to pick it up and live in the US, grab it on amazon. If you are Canadian like me, Apt to Game has the best prices around. (That’s where I got mine).